WWI Profile: Guy Ellis Watson 1895-1918 | Friends of Fort Caswell Rifle Range, Inc. 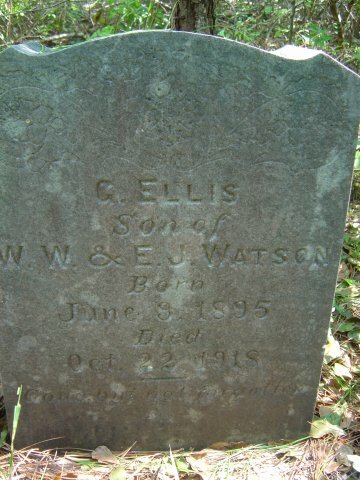 Guy Ellis Watson was born around 1895 in either New Hanover or Brunswick County, NC, and raised in Brunswick County. The 1900 Census shows him born in June 1893 (with brother Quincy Manual born in March 1893, clearly a mistake was made), living in Town Creek, Brunswick County, with father Wiley Worth and mother Eliza Jean Watson. The 1910 Census lists Guy as 15 years old, a laborer at the farm. His brother Quincy is now reported as 17 years old, also a farmer. There are a total of seven children reported as born, all living. Guy’s WWI Draft Registration Card (listed as Ellis Watson) shows him born in New Berlin, NC, on June 9, 1894, living in Leland, single, and working at a sawmill (Appomattox Box Shook Company). His NC WWI Service Card lists “Hanover, NC” as his birthplace. Ellis Watson was ordered to report for duty on March 22, 1918 [Source:Ancestry] and sent to Camp Jackson, NC. On April 24, he went to Medical Detachment, Embarkation Hospital, at Camp Stuart, VA. At the same time, Brunswick County Privates Willie Winfield Millinor (on our WWI Wall of Honor) and Roy McKeithan (later Sgt) were assigned, presumably making the trip with him. Note: More Brunswick County men could have served there. NC WWI Service cards of those serving in Medical Detachment units do not always include the location of the hospital. There were many responsibilities at the hospital, and no information to determine exactly what Private Watson did while serving. 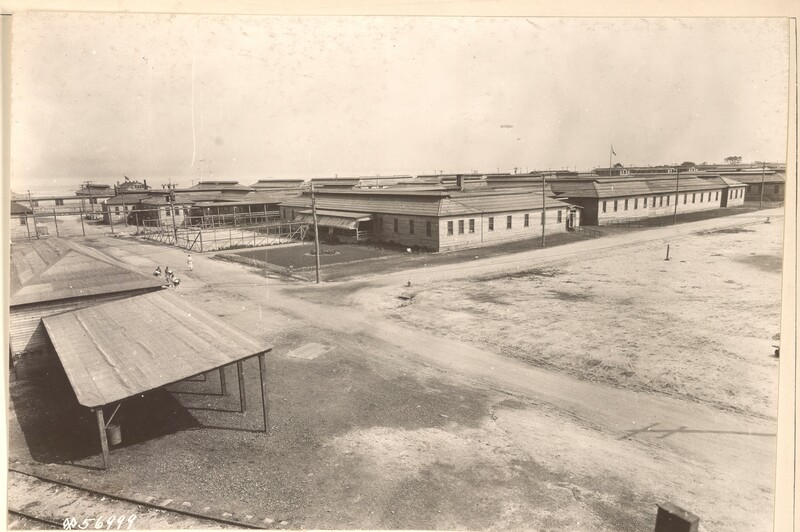 Some of the more interesting duties include mosquito control due to Camp Stuart located within a swampy area; the control of flies, many because of the holding area for horses to ship overseas and the dumping of manure into the swamp; the control of bedbugs, cockroaches, fleas and lice; and embarkation and debarkation delousing stations. In 1918, over 273,000 troops moved through the embarkation port. Private Watson was attended from October 9, 1918 to October 21, 1918 in the Camp Stuart Hospital for influenza. During that time, his older brother Quincy Watson passed away from influenza/pneumonia on October 11 in the High School Emergency Hospital in Wilmington, NC, where many were dying from the influenza pandemic [Source: Death Certificate in Ancestry]. Read more about how influenza affected NC in Robert Guy Farmer’s WWI Profile post. Guy Ellis Watson eventually succumbed to acute lobar pneumonia on October 21, 1918. [Source: Death Certificate in Ancestry] Historical data shows a peak of patients and deaths occurred in the hospital during the month of October 1918 during the influenza pandemic with a total of 5,562 patients (4,425 new cases of influenza) and 204 deaths. Guy Ellis Watson was laid to rest in Benton Cemetery in Maco, Brunswick County, NC, joining his older brother, Quincy Manual Watson. His headstone, shown above, gives no indication he died while serving his country.